If you're anything like me, when you watched American gymnast Gabby Douglas compete in the individual all-around finals, you had much less composure as a spectator than the eventual gold medalist did as a competitor. And when she won and waved with the poise and calm confidence of tiny American royalty, you may possibly have cried a little bit and had to take some deep breaths into a paper bag. Douglas is easy to be proud of — she's the best at what she does, she's strong in her convictions, and cute as a button. She's got more class and asskickery in one of her leotard crystals than most humans do in their entire bodies. 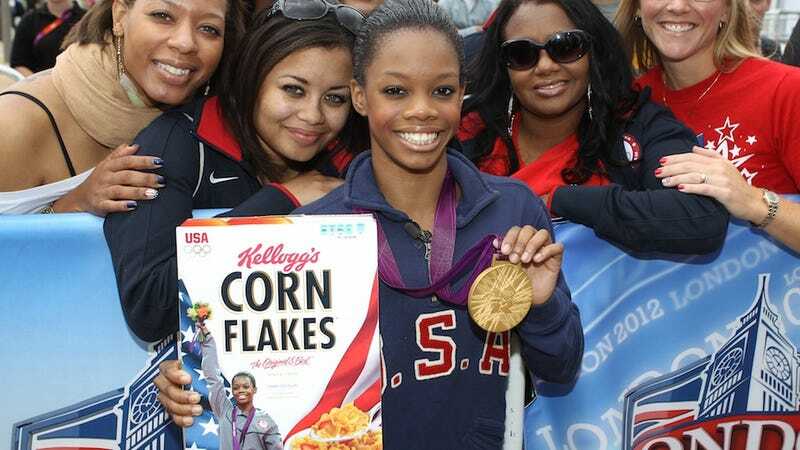 And soon, marketers will do their darndest to harness those qualities into a Gabby Douglas-led marketing explosion. And I'll totally fall for it. Everyone loves Gabby Douglas right now. Gabby Douglas is to American pride and solidarity what the Chick-fil-A protests are to the sort of division and discord our children will interpret as a terrible reflection of a backward time full of jerks. We want to hug Gabby Douglas. We want to hug her mom, and her host mom. We want to carry her giant backpack for her. We want our kids to want to be like her. As a 16-year-old, she has really got kind of the sky is the limit. She brings so many intangibles that marketers look for. She's young. She's fresh. She's a new face. ... America is looking for heroes. We went into this looking for Michael Phelps and Ryan Lochte and we are going to come out of it with a new gymnastics face, and that's terrific. Everyone's happy for this person — how can we exploit this to make money? My brain read that quote in the voice of Joe Pesci's evil character from Home Alone. Douglas is already slated to appear on a box of Corn Flakes (which I will buy, because I still have the 1996 Magnificent Seven Wheaties box), and has already started making the talk show circuit. And other companies can't wait to put Gabby's grin next to their products. BUY THIS THING. OTHERWISE GABBY DOUGLAS WILL STOP SMILING. Dominique Dawes, a member of the 1996 team, said she was happy for Gabby, but said it's important for young athletes suddenly thrust into the spotlight to be careful about who they choose to spend time around, and what products use their image to promote their products. I'm not a close personal friend of Gabby Douglas, nor do I know the way she thinks, but she seems to have a good head on her shoulders. Let's hope she only lends it to selling stuff I actually need, because I could probably be convinced to buy a closet full of Gabby Douglas brand mufflers.